Usability work is often related to user experience, and both concepts have a remarkable recognition among usability professionals, among other web consultants, among our clients and in corporate management. I would like to go beyond the words “User Experience” and give a clear, concise, simple definition that’s easy to remember, that everybody can understand. I like the definition to be in a non-marketing language (as marketing language in my opinion has limited life; it is often worn out by tiresome clichees). Most importantly, it must be easy to use, so that I (or anybody else) can evaluate a website with this definition. This got me thinking: What I really want is to define User Experience so that the term is usable. This has definetly been in my head for some time now, and todays Webword post “Windows Vista User Experience” triggered me. Before we move to the examples, I must say that this list is big enough so that I’ll need more brain power to digest it. I might follow up on this in a later post, and I really appreciate your comments on the list. Are there any important other definitions? What do you think of it? Ideally i’d hope that we can end up with one clear definition for everyone to use. Tell me what you think. User experience is a term used to describe the overall experience and satisfaction a user has when using a product or system. It most commonly refers to a combination of software and business topics, such as selling over the web, but it applies to any result of interaction design. Interactive voice response systems, for instance, are a frequently mentioned design that can lead to a poor user experience. I was not able to find a definition on Jesse James Garret’s book page (and I haven’t read the book — yet). The term “user experience” refers to a concept that places the end-user at the focal point of design and development efforts, as opposed to the system, its applications or its aesthetic value alone. It’s based on the general concept of user-centered design. Independently, none of these factors makes for a positive user experience; however, taken together, these factors constitute the main ingredients for a website’s success. User Experience (UX) is an emerging field concerned with improving the design of anything people experience: a web site, a toy, or a museum. UX is inherently interdisciplinary, synthesizing methods, techniques, and wisdom from many fields, ranging from brand design to ethnography to library science to architecture and more. Another model worth mentioning is Peter Morville’s Facets on the User Experience mentioned in a 2004 essay “User Experience Design“. 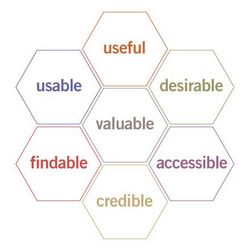 When I broadened my interest from IA to UX, I found the need for a new diagram to illustrate the facets of user experience – especially to help clients understand why they must move beyond usability – and so with a little help from my friends developed the user experience honeycomb. Peter Morville: Seven facets of User Experience: useful, usable, desirable, findable, accessible, credible, valuable. Find a brilliant explanation of the seven facets on Peter’s website. The honeycomb hits the sweet spot by serving several purposes at once. First, it’s a great tool for advancing the conversation beyond usability and for helping people understand the need to define priorities. Is it more important for your web site to be desirable or accessible? How about usable or credible? The truth is, it depends on your unique balance of context, content and users, and the required tradeoffs are better made explicitly than unconsciously. Second, this model supports a modular approach to web design. Let’s say you want to improve your site but lack the budget, time, or stomach for a complete overhaul. Why not try a targeted redesign, perhaps starting with Stanford’s ten guidelines as a resource for evaluating and enhancing the credibility of your web site? Third, each facet of the user experience honeycomb can serve as a singular looking glass, transforming how we see what we do, and enabling us to explore beyond conventional boundaries. 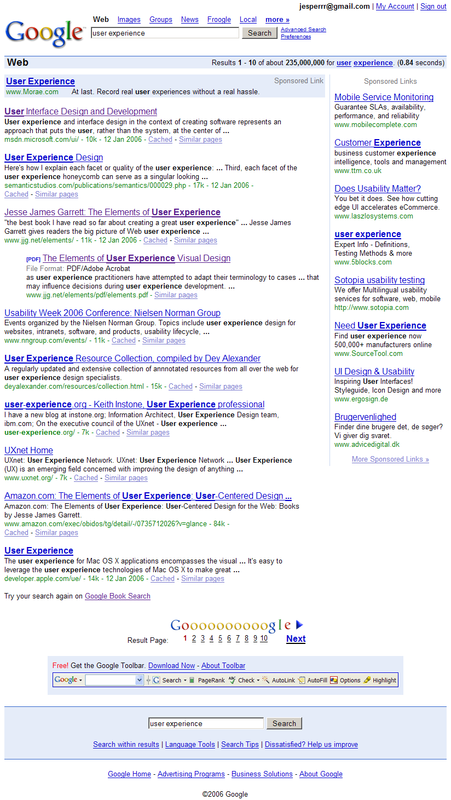 A Google Search on user experience reveals 235 million hits. The three links mentioned by Wikipedia are number 3, 8 and 13 on the search result page. Let’s end this roundup with what triggered me: The Webword post “Windows Vista User Experience“. It’s basically a pointer to a Microsoft web page describing (in marketing words) the user experience we can expect when Windows Vista launches. I highlighted the word “experience” and it turns out that this is not only “user experience” but also “computing experience” and “desktop experience”. Hmm. This is probably where marketing and reality meets. Windows Vista introduces a breakthrough user experience and is designed to help you feel confident in your ability to view, find, and organize information and to control your computing experience.The visual sophistication of Windows Vista helps streamline your computing experience by refining common window elements so you can better focus on the content on the screen rather than on how to access it. The desktop experience is more informative, intuitive, and helpful. And new tools bring better clarity to the information on your computer, so you can see what your files contain without opening them, find applications and files instantly, navigate efficiently among open windows, and use wizards and dialog boxes more confidently. 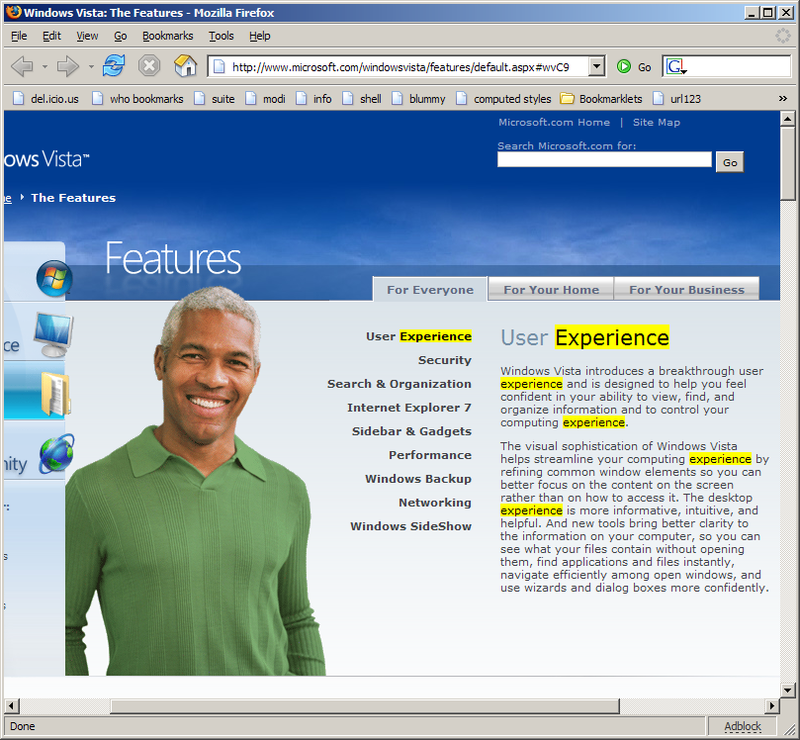 Text and screenshot from Windows Vista User Experience and features overview. This entry was posted by Jesper Rønn-Jensen	on Sunday, January 15th, 2006 at 02:14 (GMT-1)	and is filed under Usability. You can follow any responses to this entry through the RSS 2.0 feed. Both comments and pings are currently closed. Popular conceptions of User Experience are always involved with trying to prove something. It is a hopelessly paranoid way of looking at something. Forget all that. User Experience is just simply *the practice of appreciation*. It is the quality of the *value already present* (and it is always fundamentally complete rather than engaged in a process towards completion). Forget about what the above definitions would have you believe (and totalizing words like “modular” “elements” “facets” “factors” and “the overall”) — that’s all bunk and proselytizing from consultants and marketers! Nice review. Unfortunately I’ve been grappling with a similar problem with “usability” for years. There aren’t any elevator speeches available. Tough to get it right. Very annoying. Very nice review. You need, however, to make clear to yourself why you are interested in the “user experience”. Whether you are interested because you are about to make a web site that is to be “intuitive” or whether you want to make a banking trading application for traders where the success criteria is functionality, speed, and logical consistency, rather than intuitiveness. 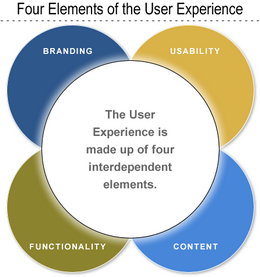 Also, the problem with defining a concept like “user experience” is that the “user” is not well defined. We are all users, but we will have different experiences with the same application or web site. Therefore, although it is always nice to be able to find a common denominator to what is “user experience”, it becomes interesting only when looking into the concrete problem space to determine how to make the best user experience for this specific types of users in this specific context. Thanks for the pointers, Jesper. In short, he approaches the (web) user experience as the result of two different systems; the web as software and the web as hypertext. Jesse James Garrett’s definition of the user experience is how the product behaves and is used in the real world. This definition is preceded by a hilarious string of events that describe why Jesse didn’t get to work on time, all because of a series of interactions with products that had flaws in its design. He then goes on to explain that user experience is not about how a product works on the inside (although that sometimes has a lot of influence) but how it works on the outside, where a person comes into contact with it and has to work with it. Jesse’s book The Elements of User Experience then explains with concise clarity what it takes to create a user-centred design for the Web. Definitely worth a read.